IMTG is proud to be an official code partner with SuiteCRM. 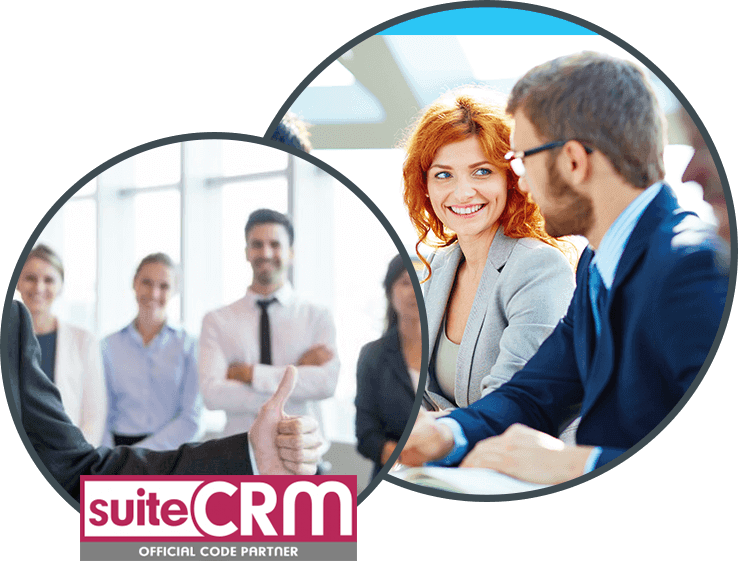 SuiteCRM is the world's most popular CRM software solution. It is proven, reliable and enterprise-ready. It is just as good as the biggest and most well known names in the space, and it can help empower your sales force, your service team and your marketing department. And best of all, there are no licensing fees because it is open source software. Get in touch today to talk to an expert and find out more, there is no cost or obligation. The world's best open source CRM software, delivered, managed and supported by Australia's #1 provider for SuiteCRM. Far too many times support lets down the other vital aspects of IT solutions. This is your chance to take on SuiteCRM and turn it into the asset you need it to be; enhancing sales results, being a medium for collaboration, a way for managing key relationships, a store of useful information and a way to ensure sales compliance. Best of all, you do not have to go at it alone. IMTG are Australia's experts in SuiteCRM, can help with all aspects of setting up and configuring your CRM to your exact needs. And they can be there to support you and your team. Stay away from ‘vendor finger pointing.’ If other vendors are involved, we manage them for you so that you have a single point of contact, whose job it is to make sure that your staff are able to get the help they need quickly and easily so that they can get on with their jobs. The person you speak to is the one who can help you and answer your questions. Far too often Level 1 support is just customer service. Which means they need to go and find out how to resolve your support ticket. Our support desk has developers and system administers sitting next to each other so that they can handle any ticket quickly and completely. With our outsourced support you get an empowered team, able to look after you from the application to the servers and the infrastructure to the network, the users’ PC, all the way inside the application code. Focused On Results Not Process! Believe it or not, most support teams are managed based on how many tickets they close or do not close. Unfortunately, for the users this is not what they care about — they are only concerned about having THEIR issue resolved as quickly as possible! This is why we manage the support team based on how happy clients are and how well they help you, not how many tickets they have or not have. We don’t manage process, we manage for results, to you, every time. The Service Desk won’t let the ticket go until it’s resolved. We have gone the extra mile many times and the team is prepared to do this for you as well, “Whatever it takes to keep you happy” is their motto. We track 100% of all requests logged with the Service Desk regardless of how you log them, by phone, email or the web. — Nothing goes missing, nothing falls through the cracks to be certain that there are no unsatisfied users. Log your support tickets either by phone, email, or the web. You can customise support availability to suit your business. Customise how your end users interact with support: Depending on your support plan you can deal with us via email to get answers to your questions, or call us for in-depth support or have us “virtually” take a seat next to you and guide you through what you are trying to get done until it’s done. No levels of support : no 1,2,3 back to one and around it goes… every person on the Service Desk is trained and able to help you. If they need others to assist they will do that but they will own the issue until it is resolved. We don’t use order takers (aka level 1) to deal with high volumes. No call centres : The team is our own staff and they are there to assist you, period. They don’t have to wear other hats as well. In order to keep response times low and resolve queries fast, we maintain a very small ratio of Service Desk analysts to clients, because we like it best that way, to keep things close and connected. Consulting: Have Australia's premier experts work on your side to help you make the right decision about your CRM system. There is no reason to go through this on your own, or have your team take stubs in the dark; or worse succumb to the slick marketing machines of huge corporations. Get to talk to an expert, and get tailored advice for your own unique circumstances. Don't talk to a call centre. Get in touch today to talk to an expert and find out more, there is no cost or obligation. Implementation: Your support tickets are responded to either by Email or Phone depending on what the support request asks for. Get in touch today to talk to an expert and find out more, there is no cost or obligation. Training: Your support tickets are responded to either by Email or Phone or Using an interactive screen share (“virtually sitting next to the client looking over their shoulder”) depending on what the support request asks for. Get in touch today to talk to an expert and find out more, there is no cost or obligation. Hosting: You Get everything for your package along with ‘done for you’ admin (e.g. add users, bulk load leads, create customised reports, extend the entities captured in the CRM, add custom fields and deliver remote training to new hires so they get up and running with the system as quickly as possible). This is like having your own admin at your disposal when you need them, without the overheads. Get in touch today to talk to an expert and find out more, there is no cost or obligation. Support: You and your team can focus on what you do best, delighting your customers, clients, students or patients. You can have the peace of mind knowing that our expert team is a call or email away to help you get the most out of your CRM. Whether running a report while you're in a hurry, or reminding you how to setup a saved filter, support is always there to help you. Get in touch today to talk to an expert and find out more, there is no cost or obligation. Add-ons: You already know that SuiteCRM is the best open source CRM system available today. It is enterprise ready and has a lot of functionality that comes built in. It also has a thriving ecosystem of developers from around the world offering functionality you can find useful. From time management and time tracking, to voice and SMS integration, to mobile apps and server-side connectors for all popular email system, the SuiteCRM ecosystem has a lot to offer. Our IMTG experts are here to help you select the best and most appropriate add-ons for your installation if you need any. Get in touch today to talk to an expert and find out more, there is no cost or obligation. Customisations: Your business and the way you and your team works are unique. This is why no "one-size-fits-all" system can do what you need, and that's where SuiteCRM excels. It is highly configurable and customisable. Most configuration and customisation is done by point and click, by your own CRM administrator, or by the IMTG Service Desk support team. For anything else, IMTG can help you with custom development and integrations, just see below. Get in touch today to talk to an expert and find out more, there is no cost or obligation. Integrations: When you have existing systems to work with, either to link up and move information from them to the CRM, or to use data in SuiteCRM to drive those other systems, integrations are key. A well planned and executed, effective, integration can save your team significant time and money. Get in touch today to talk to an expert and find out more, there is no cost or obligation. The team at IMTG can help scope, specify and build the integration for you, or work with your internal developers to guide and support them as they integrate your internal systems with SuiteCRM. Upgrades: You do already use SuiteCRM? Do you wish you had a vendor to support you, in your own timezone, and with intimate understanding of the system so you can manage upgrades to take advantage of the latest speed and functionality enhancements? Look no further, at IMTG we specialise working with clients who already have SuiteCRM in place and are looking for support, or even just to upgrade their system to the latest stable version. If your organisation is already using SuiteCRM please get in touch now and we can run a complimentary 12-point assessment on your environment to make sure you are taking full advantage of the capabilities the software has to offer. Migrations: You are using Sugar CRM, Salesforce, Zoho, Goldmine, Pipedrive or another system that no longer does what you want? Have you found that the more successful you get, and the more sales staff you add, the more your CRM bill gets out of control? Or are you just simply sick and tired of paying per user per month for software licenses? Whatever the reason, if you have a CRM in place you ought to look and evaluate it against SuiteCRM. And if you SuiteCRM proves a better options for you, the team at IMTG will migrate your information from the old system to a brand new SuiteCRM instance that is fully under your control. We have 100% success rate on client migrations from anywhere to SuiteCRM. That's anywhere, excel, smartsheets, custom built MS Access databases, File maker pro databases, Sugar CRM, Salesforce, Zoho, Goldmine and many, many others. Get in touch today to talk to an expert and find out more, there is no cost or obligation. Purchase The Level Of Support You Need! We won’t charge you by the user. Contrary to popular belief the number of hours of support you need is not directly linked to the number of users. So when we support an application we agree the number of hours you’ll may use. And we bill in 6 minute increments (so an hour of support goes a long way) — unlike other support services who bill in 30 minute increments or more. A much better return on investment for you - at least 5x the number of interactions for the same investment when compared to the industry norm. We know that not every month is created equal so we don’t hang up on you once you’ve used your ‘hours’ for the month. We continue to handle support request as normal even when your monthly quota is used up. At IMTG we understand that support is not a one size fits all affair. Get extended support availability (you choose between 8:30am to 5:30pm, or 7am to 7pm or even 24x7 365 days per year). Opt for our Platinum level support package where you get access to a dedicated 'priority phone and email line' so your support requests are always treated as priority and handled with a guaranteed response time so you know exactly what to expect. These thought provoking insights are only available to our subscribers.